Many hikers are taking steps through areas that were wiped out in the January 9 mudflow now that the trails have been refurbished. Signs have been posted and websites have been updated. Hikers are asked to review the latest reports on each trail before heading out. 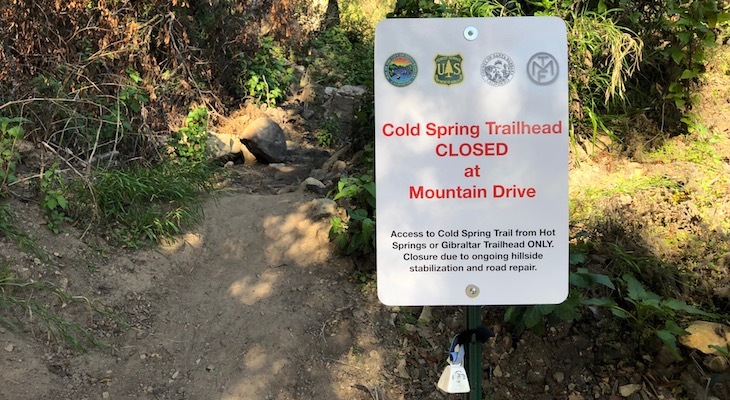 Some of the familiar routes may still be unstable and in need of trail work by one of the many volunteer groups that have spent weeks improving the hard-hit areas. We hiked the west fork of Cold Spring last weekend and avoided the trailhead by hiking in from Hot Springs which is open. That said, we saw lots of people parked down at the Cold Spring trailhead and hiking up from there. There has been some nice trail maintenance done above the Cold Spring tunnel - where the trail had been covered by shale there are now wooden retaining boards. At the upper trailhead on Gibraltar Rd, it was a mess from all the camper vans that have been overlanding there. I even found a business card from an employee of Innovative MEMS Technology in Goleta - shame on you for leaving trash up there. Montecito Trails Foundation has been very involved in getting the trails usable. Hikers and riders might want to join MTF (listed in phone book). A wonderful trail map comes with membership and their money goes toward maintaining the trails.